A couple of weeks ago I made a sweet and absolutely delicious Apple Crisp. DELISH. I’m telling you! My favorite part of the dessert wasn’t even the warm, cinnamon-nutmeg spiced apples. What I loved most… the oatmeal and brown sugar oatmeal topping. It was fabulous. With that in mind, and because I needed another breakfast option, I decided to give Baked Oatmeal. We’ve had it twice already and have extra in the fridge ready to heat up for breakfast tomorrow. 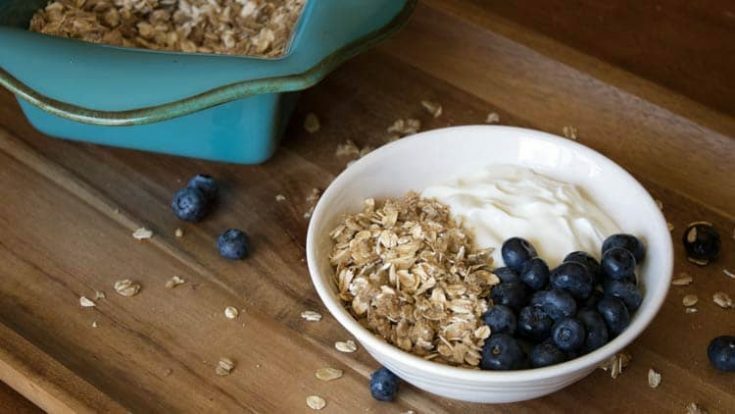 Topped with vanilla flavored Greek yogurt, the texture variance between the oatmeal and yogurt makes for a smooth and crunchy experience in one meal. Like nearly everything I make (hello Hot Fudge), this recipe is super simple. Mix together oats, brown sugar, and melted butter. Incorporate the butter so it is pretty evenly distributed. You want to have a nice golden finish and some of the buttery richness in each and every bite, even though there isn’t a ton of it in this recipe. Next, either spread out the oatmeal mixture in a baking pan or divide evenly between four small baking dishes. They need to be able to hold a couple cups because they will each have nearly 3/4 cups of the oatmeal mix and another 1/2 cup of yogurt when all is said and done. Bake at 350 degrees for 20-25 minutes. You can serve immediately, or cool and serve. I prefer to top with Greek yogurt right away and then eat up this delicious Baked Oatmeal creation. It’s out of this world good! Want to get your fruit kick in with the same meal? Simply toss a couple cups of fresh or frozen peaches or apples with a tablespoon of flour, a dash of cinnamon and nutmeg, and a sprinkle of granulated sugar. Add the fruit to the bottom of your baking dish, cover with the oatmeal mixture, and then bake according to directions below. Serve with vanilla flavored Greek yogurt. Optional- 2 cups apples or peaches mixed with one tablespoon flour, dash cinnamon and nutmeg, and a sprinkle of sugar. Mix together oats, brown sugar and butter. Bake in an 8x8 pan or in four 8-ounce oven-safe baking dishes. Bake at 350 for 20-25 minutes. Top with vanilla-flavored Chobani Greek yogurt.